I recently read about something called Project Simplify 365. After reading about it, I thought it would be a great way to help us work towards downsizing before moving. In a nutshell, you do one thing a day, big or small, to purge from or organize your home. For day one, I sorted through Maverick's overflowing toy basket and bagged up half of them to donate to the puppy room at a local pet store. 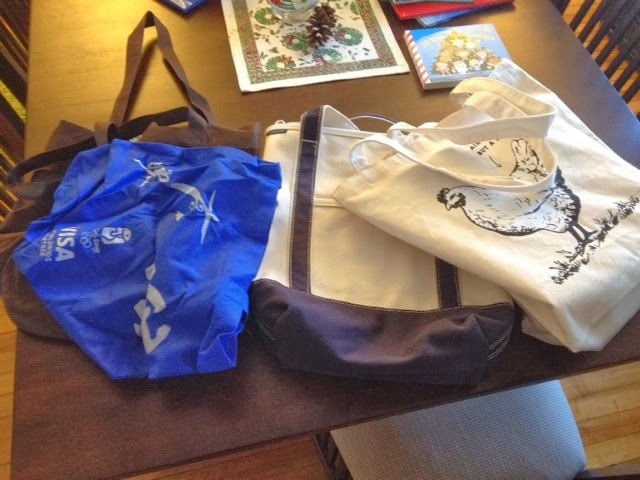 Day two (today), I went through my reusable bags to see which ones I wanted to part with. I got two really nice canvas bags for Christmas and in an effort to start a "one in, one out rule" I chose two to give away and put them in our Good Will bin. Out with the old (on the left) and in with the new (on the right). After all was said and done, I was thinking a one in, two out rule might be beneficial in actually downsizing since one in, one out would inevitably maintain our current status of stuff but this is a journey and I am still working on letting go of the stuff that is weighing me down. At least I have used all of the bags that I kept in the past few months. It is holding on to things that I never use, or haven't used in over a year, just for the sake of keeping it that I would like to avoid. I had a fun evening out with my mom. Since she has her fair share of "stuff" too, the only item we gave her for Christmas was an updated family photo of us. With it, I gave her a card inviting her on a date with me tonight. We don't get a lot of one on one time. As soon as David got home I was off to pick her up. We went out to eat and to see Saving Mr. Banks and had a really nice time. I missed Ayden since I didn't get to help put him to bed but did enjoy the break. Crazy how our kids can do that to us, isn't it? It really is the most difficult yet most rewarding thing I have ever done. Now I am snuggled on the couch with David. We have the fire place going and are going to watching something on Netflix. TGIF! Have you ever done anything like Project 365? How did it go for you? Flashback! Here's what we were up to one year ago today: "Flashbacks"
What a great idea ... I love the feeling of purging and having a more simplified home to live in. Keep us updated! I thought so too! So far I really feel a sense of accomplishment when I complete even the tiniest of tasks for the challenge. I hope it sticks! I think I'll put a sentence or two about the day's task at the end of each post this year, just to hold me accountable and share ideas. Let me know if you start it too!